The Polar Furnace G-Class is the only outdoor wood furnace featuring ECM/DC motor technology on the fan assembly. ECM/DC motor benefits include much higher electrical efficiency when compared to older shaded pole and PSC motor technology. Other benefits include longer average service life as well as the ability to run the motor at any speed for optimal furnace performance. The smart motor control will change the fan speed to maintain stable constant combustion. For example, if the firewood in the fire chamber settles over the VOR-TECH nozzle restricting air flow the control will sense this as a change in torque and will increase the fan speed to keep moving the proper amount of air through the furnace. That’s Smart! ECM motor technology is the most efficient motor technology in the world today. The powerful G-Class fan motor uses as little as a 1/4 of the electricity older motors use. You are saving money. Electronically Communicated Motors don’t have brushes that wear out over time. On average these types of motors will work reliably almost twice as long as older motor technology with brushes. You are saving money over a long period of time. The heavy gauge induction blade is carefully sized and matched with the ECM motor to pull the proper amounts of combustion air into the heater. 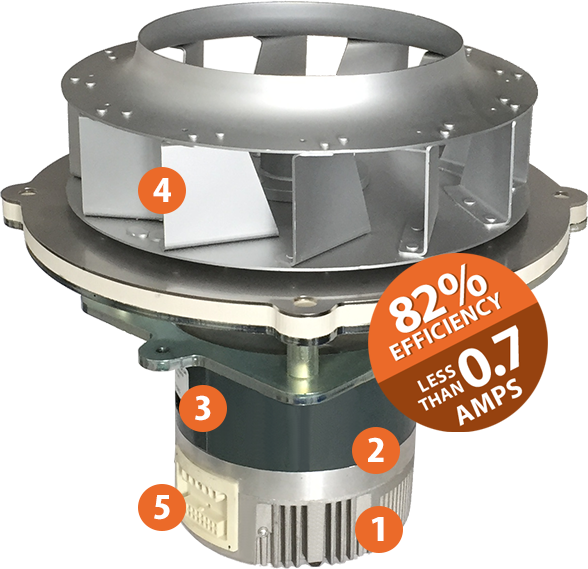 It provides powerful suction to pull combustion air through 8 air inlet ports around the primary and secondary fire chambers. With a suction based design air flows exactly to where it is needed all the time every time for steady stable combustion. Load wood and walk away. No Fiddling. The shape and angle of the fan blades are designed so that dust which would accumulate on an ordinary fan blade is swept from the blade surfaces by the air flowing through the fan. Blade cleaning is needed only once a year at the end of the heating season and quick plugs and thumb screws allow removal of the entire fan assembly in just seconds. EASY!